“The show must go on” is a long-time show-business mantra. One of the clippings in the Donna Darling Collection tells of a harrowing story of making sure the show continues. Not only once but twice. On September 25th and 26th 1926, Donna and Sammy played in El Paso, Texas at the Texas Grand Theatre. Knowing their typical schedule, they probably played somewhere in New Mexico on September 27th and 28th. On September 28 and 29, the Southwest received unusual amounts of rain. The San Bernardino Daily Sun reported that the situation was worse than they reported the day before. On the 29th they reported, “Railway and Auto Traffic In Arizona, New Mexico Paralyzed by Heavy Rains”[i] And, yes indeed, Donna and Sammy were there. The clipping she had was undated, but we know it was from September 30th and relates their story. Members of the Western Vaudeville Unit Show had a remarkable experience on their trip out here. They were marooned in Douglas on account of a washout on the Southern Pacific and had to leave their trunks and make the trip overland by stage to Tucson. 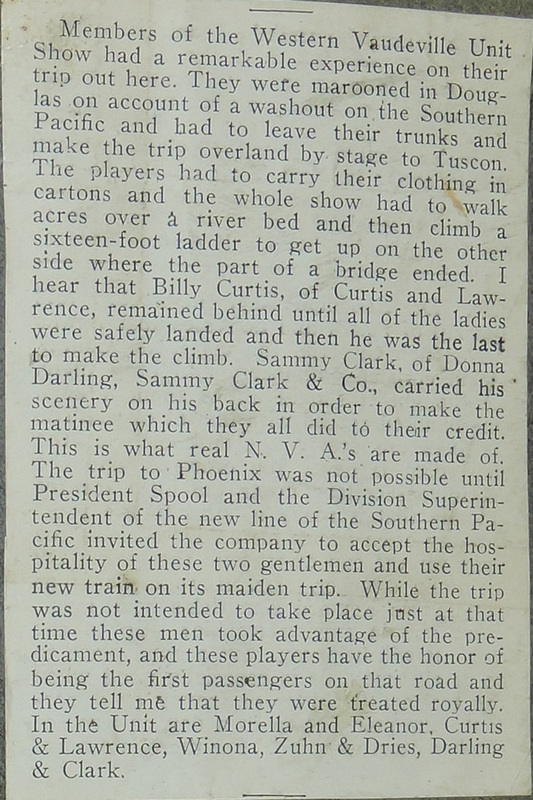 The players had to carry their clothing in cartons and the whole show had to walk acres over a river bed and then climb a sixteen-foot ladder to get up on the other side where the part of a bridge ended. I hear that Billy Curtis, of Curtis and Lawrence, remained behind until all of the ladies were safely landed and then he was the last to make the climb. Sammy Clark of Donna Darling, Sammy Clark & Co., carried his scenery on his back in order to make the matinee which they all did to their credit. This is what real N. V. A.’s are made of. The trip to Phoenix was not possible until President Spool and the Division Superintendent of the new line of the Southern Pacific invited the company to accept the hospitality of these two gentlemen and use their new train on its maiden trip. While the trip was not intended to take place just at that time these men took advantage of the predicament, and these players have the honor of being the first passengers on that road and they tell me that they were treated royally. In the Unit are Morella and Eleanor, Curtis & Lawrence, Winona, Zuhn & Dries, Darling & Clark. Wow. To make the show in Tucson, they had to traverse a river, climb up 16 feet to get on top of the part of a bridge that hadn’t washed out, all while Sammy carried their scenery on his back. It is about 120 miles between Douglas and Tucson. That is quite the trip in an overland stage. All to make the matinee at the Rialto Theatre in Tucson. The next day they were able to ride with the Railroad President and the Division Superintendent on a train’s inaugural trip on a new set of tracks from Tucson to Phoenix where the ensemble played the following day at the Columbia Theatre. [i] California Digital Newspaper Collection – San Bernardino Daily Sun, Sept 29, 1926, Page 3 – Column 2.